My love for colored jeans has expanded to colored shorts. This coral pair is my current favorite purchased from American Eagle’s sale rack. I paired them with a subtly tie dyed tank and a crochet sweater for breezy weather. I am obsessed with this sweater and have been pairing it with everything lately making it my #1 summer staple. PS the boyfriend got me this necklace as a gift for Christmas and I wear it all the time. He did good huh?!? PS#2 I stopped by Bath and Body Works for their semi-annual sale (which I’m a total sucker for, I might add) and picked up some of my favorites for a steal! Among my favorites…this coconut lime verbena candle that smells like summer and body mist and shower gel in my new favorite scent, Dark Kiss. wow this is sooo cute. you look great, like always 🙂 i love your sweater 🙂 great look. your boyfriend have a great taste, nice necklace! Hi Ashley! You are so pretty! I like this outfit. You look so natural and lovely. Love this! Those shorts are such a pretty color. These shorts are sooo CUTE! Great outfit! 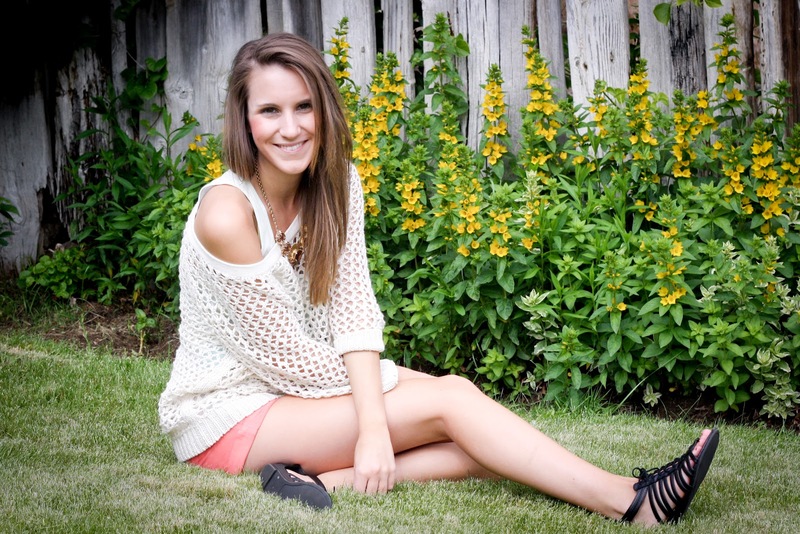 I love the color of your shorts and a crochet sweater is perfect for early summer =) Your blog is lovely! Thanks so much for stopping by my blog and for your sweet comment.Love your girly casual style,super adorable outfit.I especially love that statement necklace with that jumper. I love the crochet trend too. Your sweater is really nice. You look really pretty! I love your pieces – the crochet top, coral shorts and sandals! all amazing 🙂 I think your boyfriend has great taste! and he knows you well! your top is so great, im waiting friday and then im going in shooping! p.s. im fallowing you, and on my blog is giveaway so if xou have time check it! Love this outfit, you've got great style! Love your blog in general!